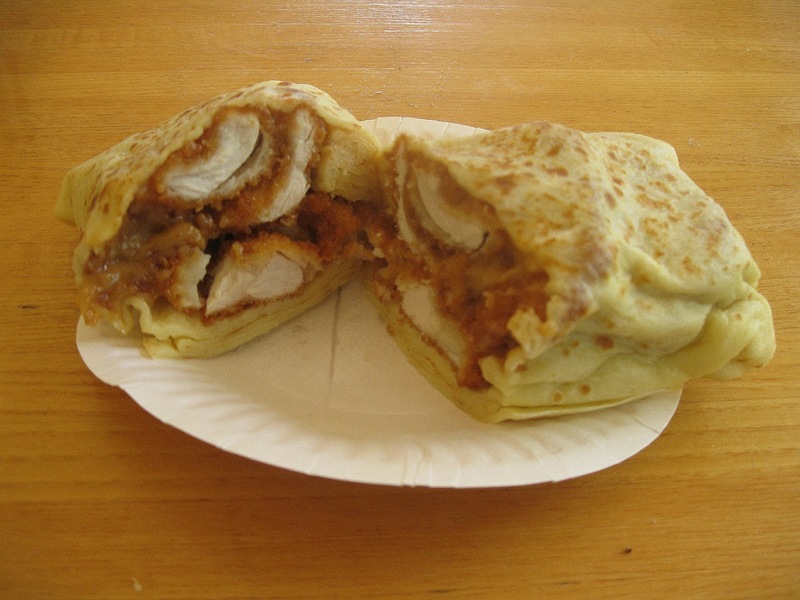 Cafe de Crepe is located at the Mississippi Marketplace food pod in Portland, Oregon. Karen and Mink run this cart, which has only been at the pod for a few weeks. They had previously set up shop on SE Belmont. Right next to Koi Fusion at the Mississippi Marketplace pod! Well, I dug into it, but everything in the chicken and peanut sauce crepe basically needed salt. Not much flavor this time around. The peanuts were very much present. The savory crepe batter also needed some salt. 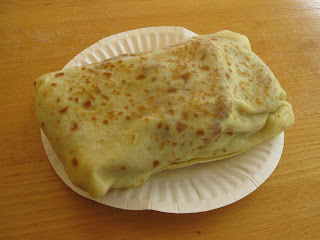 The one I got would be pretty good with sweet crepes. I suggested that vegetables and cilantro be added to pump up the flavor, color, and texture contrasts. If they're going for something Thai-inspired, I think that'd be the route to go. 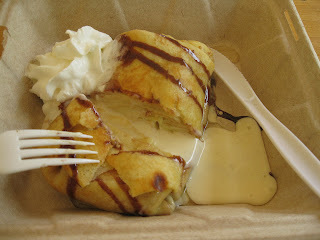 When I saw "deep fried ice cream" on the menu ($3), I also wanted to get that. 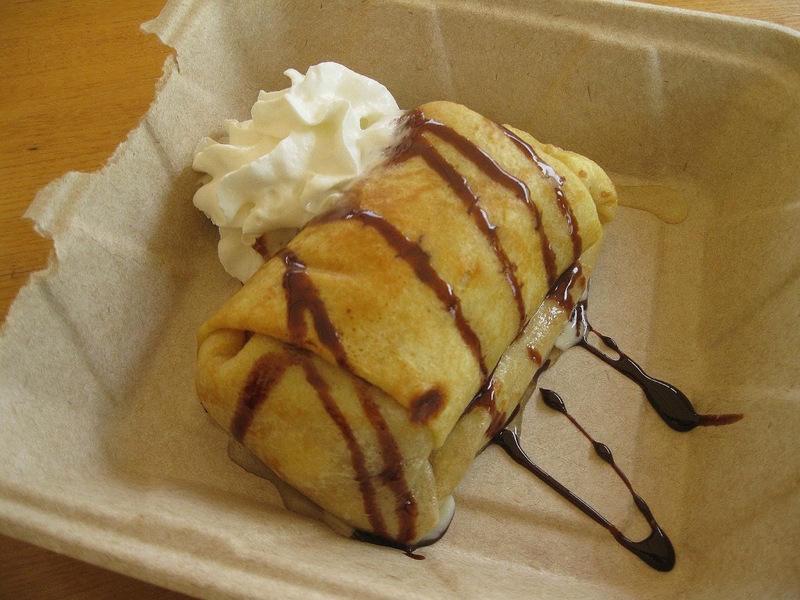 Again, a crepe holds vanilla ice cream inside, then drizzled with a bit of chocolate sauce and finished with whipped cream. It's fried up OK, but I saw a huge flaw in preparation. Do NOT stick deep fried ice cream in the microwave! Flash-fry the ice cream in very hot oil and serve immediately. Apparently, they used the microwave because previous customers complained the ice cream was completely frozen solid in the middle. Well, I'd rather have frozen ice cream than something that turns completely to liquid. The last time I checked, ice cream was a cold, preferably frozen treat, maybe with minimal melting. Let the natural outside temperatures melt the ice cream. Basically, if they hadn't tossed this in the microwave, it may have been just fine by me. The exterior remained a bit crunchy, and it otherwise worked overall for me. Despite the flaws that I saw, each of them is fixable. That's why I went back one more time in mid-June (on a sunny day!) to get the same deep fried ice cream dish. This time, Mink nailed it! Take two on that deep fried ice cream! Success! The ice cream is still frozen! The crepe exterior was lukewarm, with a slight crunch. Most importantly, that ice cream stayed frozen. I didn't care if I had to saw through it with a plastic knife. Beautiful, simple presentation with the chocolate sauce and whipped cream. Hell, I shoulda just picked it up and ate it. Simpler that way, right? The deep-fried ice cream went straight from the fryer to my plate. As a result, a couple blotches of oil tarnished the white plate. I would have liked that deep fried ice cream placed on a paper towel first to get any excess oil off that exterior. Otherwise, I'm a fan!